The Ignore Christ Easter Morning Award Goes To Google! This blog has been rather direct in pointing out that the Roanoke Times had neglected to mention Palm Sunday and Good Friday in their paper on those days. Kudos’s to the RT for the Saturday coverage of a Christian Youth Group reenacting carrying the Cross and youngsters participating in Easter Egg activities; albeit that Bunnies are to Easter as Santa is to Christmas. The Easter Sunday paper properly highlighted the new Pope celebrating Easter. Easter Sunday Morning and the Google Home Page pops-up with the angelic face of “Cesar Chavez” celebrating his 86th birthday. What a joyful experience! Apparently Google folks view Chavez’s rise from the vineyards as more significant than Jesus’ Ascension from the grave! Talk about your perspectives and priorities? Perhaps the Google-Geeks did think this through. If they put Jesus’ image on their homepage for Easter they would be bound to put Mohamed’s image there for Ramadan. That would result in numerous Radical Muslim Terrorists attacking Google facilities and employees all over the world. Apparently there’s no risk in slighting Jesus! Or is there? Is this not an object study in contrasts, or what? The AGW Man-made Global Warming Alarmists continue to use retreating glaciers as examples of man's adverse impacts on the environment. They never present their examples in the context of earth's long-term or even short-term history or the extent of earth's significant natural variations. The Nigardsbreen Glacier in south-west Norway is yet another example of the glacier retreat that occurred at the end of the Little Ice Age (circa 1750); totally independent of any contribution by mankind. Africa sending aide to frozen Norwegians -- will the UN send help soon? Roanoke Times, 3-29-2013, Pg 3: Obama calls forgetting Newtown a shame. It’s an Obama illusion to declare that Americans have forgotten the horrible massacre of little children at Newtown? It’s an Obama illusion to do a photo-op with distraught white parents. The major victims of violent crime are Black Parents! Where are all the distraught parents from his home town of Chicago where 270 children have been killed in three years and Obama's proposals do not solve this gang and drug based disaster. It’s an Obama illusion to focus on laws that have not been shown to decrease violent crime anywhere in the country. In fact, strict gun control cities like Chicago and DC have the highest rates of violent crime. And only the mental health initiatives may help, however, these are being totally watered-down to be politically and socially correct. No words here about the bigger violence picture; Operation Fast&Furious and the support to violent actors in the Middle East and in South America and Africa. Is It Not Good Friday In The Roanoke Valley? Apparently Not! Just read today’s Roanoke Times and they were fastidious in avoiding any mention of Good Friday or Easter. Dan Casey almost blew it in his blog! But he pulled it out with a small-g! Good for him - a capital-G might have ended his career at the RT! How small and insignificant these editors of the Roanoke Times really are. Somehow their immersion in the liberal-progressive culture (emphasis on the cult part) has caused them to lose perspective and relevance. Their pathetic boycotting of Christian events and history diminishes them and not the Christian Community or Faith. All this is nicely consistent with their Virtual-Muslim Mentor in the White House and will serve them well with those of that community. As an important service to their followers, they were able to proudly communicate on Pg 8 the Saturday Conference at VT in support for the transgendered. It’s a good thing to help profoundly confused people who can’t quite reconcile their bodies with their behaviors and the folks at the RT are in the forefront of that movement. Apparently they will be changing all their restrooms at the RT from Men and Women to WhoEver. Didn’t we used to arrest men who hung-out in Women’s restrooms? Government at all levels are taxing everything you have and everything you do and don’t do. Taxes encompass your transactions and your assets and now under ObamaCare you are taxed for insurance you didn’t buy. Due to the massive expansion of government spending at all levels; the search is on for new targets. Sales taxes on Internet purchases have already started. Email taxes have now been proposed under the same guise as stamps for letters. The precedence for this is that Al Gore, as a government employee, invented the Internet and the government claims total ownership of the atmosphere through which electro-magnetic waves travel through space. Obama has even established a basis for taxing the sun during visits to tax-funded green energy projects. He is so creative! Does “Winning Take Care of Everything”? It’s interesting that in today’s US culture there would be a negative reaction to this Nike ad. We apparently accept this concept in politics and in sports and in business and in personal relationships. Just as with Tiger and Elin, more than 50% of marriages break-up and the current culture appear to be fine with that level of failure; everyone moves on except for, oh yes, the kids, and those single mom’s who become “head of household”. For those we have Hillary's "The Village". Apparently Tiger and Nike have hit a nerve! Perhaps it’s a feminism nerve. God forbid it’s a values or ethic’s nerve. Perhaps it’s just a “hell hath no furry like a woman scorned” nerve. Whatever nerve it is it won’t last long. We’re a fickle people in a fickle pop-culture that focuses on I-things and I-gadgets and I-stars. Tiger and Nike will continue to get incredibly richer and the fans and customers will pay the way for that financial success. After all: “Winning Takes Care of Everything”! If you must watch the news, why be depressed and misinformed? Watch: Brains, Beauty, Poise and Grace and be enlightened and enriched! Roanoke Times, 3-25-2013, Pg 3: Cyprus secures bailout. A lengthy article that totally omits the most onerous actions taken by any democratic western country in memory – confiscation of personal money directly out of personal bank accounts! Just how chilling is that? This is the actions we expect from Communists and Fascists and Banana-Republic Dictators not Democratic governments. Wonder why our Liberal-Pravda press forgot to mention that fact? Perhaps it’s because their mentor keeps saying that $20 Trillion in debt is not important! Don't worry about it! What could possibly go wrong? The Cyprus government will be confiscating up to 40% of bank personal deposits! When governments (whoever is in power) are faced with default (bankruptcy) and economic collapse they will go get the money from those who have saved it! Our challenge is to get our house in order now (balance our budgets and live within our means). This is what you and I have to do, it’s what Virginia does, and it’s what the other states and the US government must do now. The Obama administration will successfully kick-the-can down-the-road and avoid the coming tsunami of draconian actions that will result from our reckless and irresponsible spending, borrowing and taxing actions. Good for him, Bad for America! Whatever happened to that Barack Obama? NYC Mayor Bloomberg and VP Joe Biden and scores of gun control activists and PETA members are marching through the snow to Punxsutawney PA today to protest the easy access to firearms by unstable residents of Pennsylvania. They claim that if only better background checks were in place this tragedy would not have occurred! Al Gore and the AGW Global Warming Alarmists are trying to get to the protest but the major late winter storm has grounded most air flights and they are all very busy trying to explain how March snowstorms are caused by man-made AGW CO2, an event they claim is unprecedented in the earth’s history. Punxsutawney Phil, king of the groundhogs, was found dead from an apparent self-inflicted gunshot wound after predicting an early Spring. Is It Palm Sunday In The Common Year Of 2013? Read through The Roanoke Times and Daily Movement this morning and couldn’t find one word about Palm Sunday. There was however a Big Big section on Bugs! How sad that such a significant and historic and religiously significant day should be totally slighted by this major paper in a region that has a significant Christian presence. Little wonder their readership and sponsorship is dwindling. Of course Palm Sunday is the personification of the fickleness of people. It was the same people who put palm branches down on the muddy trail for Jesus that just a few days later would yell “give us Barabbas”! Apparently this marginalizing of the Christian religion by the Editorial Girls of the RT is consistent with Obama’s proclamation to the Muslims that America is not a Christian nation – in which case why mention a significant Christian event? As a somewhat challenged literature and language person I was very surprised to learn that our keepers of our American-English language have also joined the War On Christianity. They have renamed our calendar and time to eliminate the nomenclature “The Birth of Christ”. It would be appropriate for all Christians to avoid and boycott any and all literature that has made this anti-Christian assault upon The Bible, History, Culture, Traditions and Values. Apparently there aren't any bounds to the anti-Christian actions of the Liberal, Progressive and Atheist movements in our Country. Why stop with just taking God out of our Calendars, Schools, Government and The Boy Scouts when you can purge it totally from our culture? How Sad! I don’t mean to cast blame, certainly not all of it, on our Christian ministers, but I am sorely disappointed in their general refusal to address the destruction of Christianity, which after all is the foundation of their faith and this formerly great nation. They say to me, but we have to keep politics out of the churches. I say to them, If you are not at the table you are the menu so get off your puritanical stance and get involved. You shouldn’t perhaps endorse candidates, but you can certainly take on the issues such as the attacks on Christianity, it’s principles, and those of faith and lay the blame squarely where it belongs, on the Progressives, liberals, atheists, Islamics, humanism fanatics, and so forth. Plan adds $1TRILLION in taxes and “cuts $875 Billion”. Works late on budget plan – what an understatement – FOUR YEARS without a budget by Obama and the Senate Democrats – talk about late! And $1 TRILLION in tax increases fits right in with increased debt, increased deficits, more spending and more borrowing – they sure are consistent! So much for responsible fiscal policy and care and concern about the financial health of our country and our children. And how about their math? If these are real cuts – why more taxes? CHICAGO (Reuters) - Chicago will close 54 schools and 61 school buildings by the beginning of the next academic year in the country's third-largest public school district, a move that education experts called the largest mass closing in the nation. The only thing left now is for Obama (our educator-in-chief) and his former chief-of-staff Mayor Rahm Emanuel to join in a duet of Chicago, Chicago My Home Town! All the years of dirty Democrat Politician's and Politics have resulted in a city in decay, a city that's a combat zone, and a city that's totally dysfunctional. But the folks there will continue to vote for the same brand of virulent leaders to continue their decadent history. What a joy for the decent residents! Creators of the History channel's "The Bible" today rejected suggestions that the character of Satan in the popular mini-series resembles President Obama. Why do I see a resemblance in both figure and actions? One can only imagine the fire & furry if FOX had done this! ‘Amazing Race’ episode set in Hanoi sparks outrage over use of B-52 wreckage as prop, and included communist song. “I’m so outraged by this I can’t believe it. CBS is idiotic; they’re stupid,” said Bob Beckel (a Liberal Democrat on “The Five” show). ‘Hanoi Jane’s’ Friends and Associates are still bashing and demeaning our service members who served our country in Viet Nam with valor and distinction with many of them making great and supreme sacrifices. Over 50,000 gave their all! To them we owe a solemn debt of gratitude. It’s difficult to comprehend how these people not only exist in our midst, but actually greatly prosper and bask in the liberal culture and positive media spotlight. God’s forgotten, and the soldier slighted. Finally an apology from CBS -- why was this so hard to do? Rachel’s reaction: Deer in the headlights! Why does Obama keep making public pronouncements that “the debt and deficits are not a problem”? Perhaps it’s because he and his team are looking at the availability and taxability of the personal assets of our senior countrymen, especially our 401’s, IRA’s and equity in our homes. Today’s news raises this concept to a whole new level in Cyprus, where massively accumulating debt and deficits have become a national financial crisis. The government is “taking” peoples bank deposits right out of their bank accounts! WOW! --- This is a really fast way to get cash! This would be a much faster and more efficient method of personal wealth confiscation than changing the rules and tax rates on retirement plans and home equity! Over the weekend the tiny nation of Cyprus (and its overseas depositors) became the latest Europeans to learn the painful rule that is increasingly guiding the continent’s debt crisis: the less solvent a country is, the more sovereignty its citizens must relinquish. In exchange for financing expensive bailouts of Greece, Spain and now Cyprus, the European Central Bank and richer countries like Germany are demanding a greater say on matters traditionally left up to local politicians like tax rates and retirement ages. The current Cyprus Bailout demonstrates how Insolvent Euro Nations Continue to Cede Sovereignty just as one looses control of his business, home and personal assets as a result of crushing debt and bankruptcy. Here in the US, bankrupt cities like Detroit are under receivership and profoundly indebted states like California and New York stand to loose their credit ratings as debt overcomes the ability to pay expenses and the massive service on the debt. Can the US Government be far behind? “America has a debt problem and a failure of leadership. NY Daily News: New campaign-style organization pushing President Obama’s agenda has good-government advocates fuming, press lobbing questions. Weeks after top Obama allies announced plans to convert his victorious re-election campaign into an unprecedented nonprofit, questions remain about how the group, dubbed Organizing for Action, will interact with the White House. Chief among them is what benefits will be offered to those who shell out hefty sums to help bolster Obama's legislative priorities. So, the White House is closed for tours by ordinary citizens and school children but is wide-open for high-rolling special interest parties. Obama’s massive foreign policy failures to contain the nuclear weapons and missile development programs of Iran and North Korea has required that Obama and his Progressive-Liberal associates who deep-sixed Bush’s antimissile program have now been forced to restart that program. A key consideration is that the California and Hollywood and New York Obama supporters have finally figured out that North Korean nuclear-tipped missiles can reach them in minutes from launch. A threat from the crazy North Korean leadership that finally is being taken seriously. It’s interesting that the “tolerant” liberals with their nasty labels are almost always wrong. 1.6 Billion Bullets divided by 300 Million people in the US equals (=) 500 rounds per person (man, women and child)! This massive arms buildup while this administration is making the limitations of private gun ownership a major jihad under the guise of reducing crime. In addition to the guns and ammo Homeland Security is buying are armored military-type vehicles. Apparently Homeland Security is the ruse that Obama and associates are using to bypass and negate the "Posse Comitatus" that by federal law limits the use of military power within the US and against US citizens. Homeland Security; aren’t these the folks that handed all those weapons to Mexican drug gangs under the name of Fast and Furious? How could all this military-level arms be a problem in their hands? Roanoke Times, 3-17-2013, Pg 3: Rising sea levels threaten historic Jamestown. Scientists say it will be underwater by the year 2100. 16,000 years ago the North Carolina Outer Banks were 50 miles out at the continental shelf because the ocean was 400 feet lower that it is now. 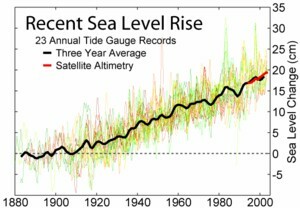 Talk about your rising sea levels! Must have been a big adjustment for the Algonquians, North Carolina’s coastal Indians! 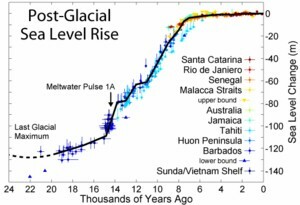 Why don’t the authors and publishers of these apocalyptic articles ever put things into perspective, and why don’t they ever publish the graphics showing the history of rising sea levels? Apparently that would spoil the fun out of scaring people who don’t remember their 8th grade earth science course and who are being brainwashed with Gorite global warming propaganda. It's nice to settle by and build your home and business near the sea; But! I apologize, I neglected to mention that this report was from November 2, 1922, as reported by the AP and published in The Washington Post - 90 years ago. Obama, the author of Sequestration, and dealer of the “Debt and Deficits are not a problem” has implemented a policy of making the 2% savings in the increase in federal spending as visible and painful and stupid as possible. Our government printed $40 Billion dollars per month in 2012 and is printing $80 Billion dollars of money every month this year and Obama says that’s OK and not a problem. Let’s not reduce waste and duplication and unnecessary programs. Let’s just keep increasing our spending, taxing, and borrowing. The bills will have to be paid and multiple generations will have their incomes and assets diverted to the government. Let’s stop tours at the White House and stop military flyovers at major sports games and other functions; this is also consistent with Obama’s downgrading the military strategy. This is leadership? 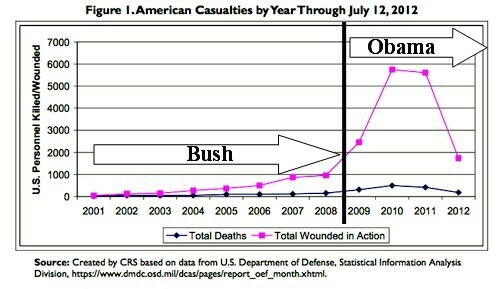 This is Hope and Change we can believe in? What a joy! Reflections of Nancy Pelosi: we have to pass this law so that we can read it! Reflections of Obama: if you like your present health providers – you can keep them! Every day brings more revelations about the negative adverse consequences of ObamaCare! In addition to the major costs are the issues of the part-time workers conundrum of the 30 hour week. Because of ObamaCare, employers are now restricting workers to 29 hours per week. This puts the workers into and onto the taxpayer paid ObamaCare coverage and ultimately many will be on Medicaid. And we haven't even gotten to the actual point of: you're sick, you need to see a doctor and then you need a medical procedure and medications. What a joy that's going to be! No public word on the 16,000 new IRS ObamaCare agents. How’s that going? Would be nice if each had some medical training so they could stop by the clinics and help out! Per new Virginia Law, doctors must now advise patients that the Lyme Disease tests are not definitive and perhaps not much better than flipping a coin. Are there any doctors in Virginia who do not know that? Apparently some members of the State Legislature have a thing about Lyme Disease and think that some doctors are not sufficiently describing the uncertainty in the test results; why stop there? This makes one wonder about "truth in testing" and it's relationship to Tort Reform, doctor's incredibly expensive liability insurance and why our tax-paid folks at the Center for Disease Control aren't publicising the data we need. How about the current Flue Vaccine being only 9% effective for senior citizens! And how about the massive waste of vaccinations that are over-bought? And what about Shingles Shots that are very expensive and the very uncertain probability of their effectiveness? The list goes on and on and begs the question -- why pass a law for Lyme Disease; particularly in a state that prides itself on limited government intrusions. Senator Obama and then President Obama declared that Afghanistan was the “good war” that he supported and that Bush had wrongly “outsourced” that war to the Afghan Northern Alliance. Last week Afghan chief Karzai, in meetings with the new (and incredibly shaky) US Defense Chief Hagel, declared that the US is collaborating with the enemy, the Taliban, against Karzai and the Afghan people. Where did that come from? Perhaps from VP Joe Biden who declared that “The Taliban Are Not Our Enemy”. Obama et-al jumped into the fray and supported that claim. Talk about your Frick and Frack! As a follow-up to that position, Obama has indeed had US representatives “meeting in secret” with Taliban leaders to discuss our “retro-grade movement” out of the country. Perhaps Karzai isn't totally paranoid after all. Yet another example of Obama’s incredibly poor management of foreign affairs with lots of negative adverse consequences yet to come. Does anyone have a count of the total number of Generals Obama has had in charge of Afganistan: Is it 5 or 6? The Roanoke Times Editorial: Teamwork needed to avoid sequester, totally avoids Obama’s complicity in the Sequester and his lack of leadership regarding our major debt and deficit issues and his irresponsible management of the Sequester. The Sequester, that Obama invented, has become his fiscal albatross. He used class warfare to ram his increased tax proposals through Congress last December without any significant spending or borrowing reduction commitments. Obama could have avoided Sequestration by negotiating in good faith and embracing meaningful debt and borrowing reductions. Instead he used fear-mongering to scare and intimidate the American people and after Sequester happened, he then set out to make the 2% reductions in increased spending as visible and painful as possible. Shutting down the White House tours reminds one of Tim Kaine closing the I-81 rest-stops when he had over one-Billion dollars of VDOT tax-money hidden from the public. The Republicans in Congress have proposed bills that will provide the managers of government departments the flexibility to implement the 2% savings by reductions in waste and fraud and nonproductive expenses. Obama and the Senate Democrats have refused to embrace these practical solutions. Bad-mouthing the Republicans is not teamwork and clearly not Presidential leadership. What a great opportunity for the man-made global warming AGW alarmists to highlight one of the biggest weather events in US “recorded” history and how that’s (not) related to man-made CO2. They so love to hype their discredited hypothesis with every significant weather event, hot and cold. Our “recorded” history started about 1895 when thermometers became of age. Doesn’t seem like so long ago – given that’s when my parents were born. 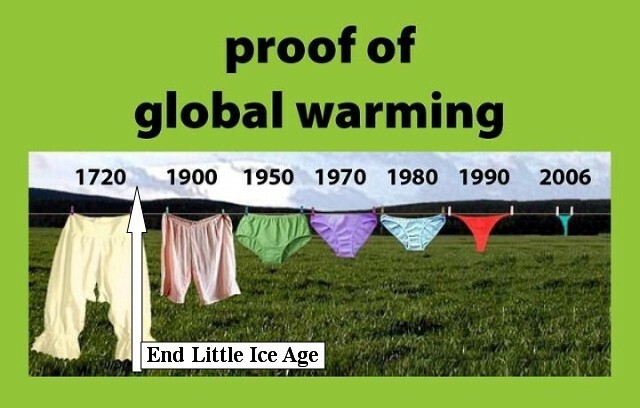 Apparently earth’s warming following the end of the little ice age (circa 1750) continues to have significant natural variability that produce weather events that do not track the atmospheric CO2! Sad news for all those super-expensive computer simulators and their "Mann-made Hockey Stick". The Supreme Court is reviewing parts of the current Civil Rights Laws that required states to submit changes to their election laws to the US government Justice Dept for approval before they can take-effect. Virginia is one of those targeted states. Apparently Virginia is a racist state as defined by this law and the RT’s Editorial Girls and by the author of this race baiting so called cartoon. How can a state that elected the first black governor since reconstruction, Doug Wilder, and recently twice elected Obama as President be, by definition, a racist state? Apparently the cartoon author and the editors of the RT have labeled Scalia to also be a racist because of the questions he has asked during the Supreme Court review of this case. The cartoon is a nasty piece of yellow-journalism. Publishing the cartoon raises that offense to a disgusting level of unprofessional conduct. Thursday’s Big News Obama-Holder: We grabbed Bin Laden’s son-in-law! No that’s not it! Would you like to guess again? The Turks grabbed Abi Ghaith. Being a Muslim country and being of sound mind they turned Abi over to the Jordanians where US agents “picked him up without grabbing”. Apparently the government of Jordan has a death-wish thing. He’s now in NYC where Obama-Holder have totally enabled him to “remain silent” and given him all the rights and privileges afforded accused US Citizens. Is Abi not a Radical Muslim Terrorist combatant? Does Obama love to coddle Radical Muslim Brothers, or what? Apparently Obama-Holden do not want to send Abi, or any other combatants, to GITMO for an extended stay and interrogation. Getting more information about the Al Qaida organization, network and facilities might be very embarrassing to those who have declared Al Qaida to be “virtually decimated” and interrogations to be nonproductive. This is the same reason the Libya-Benghazi attack was declared to be “a mob that got carried away with emotion over a video”. It’s awkward to face the truth and reality that Al Qaida is like a metastasized cancer. All this is totally consistent with Obama’s total and complete refusal to publicly state that our enemy that has declared global war against us is: Radical Muslim’s. He even declared the Radical Muslim Attack on our soldiers at Fort Hood as “workplace violence”. It’s amazing what an unhealthy mental state of Denial can do. It’s difficult to invent something really “new”. Sometimes things seem new to you simply because you’re not old enough to remember when it was originally new. Perhaps not so “new" after all! Note the right front tire on our “old” 1923 Durant Pickup Truck! That was a “solid non-air tire” that wouldn’t go flat. It had thru-the-sidewall-holes that provided some shock absorbing capability. Apparently if you live long enough – you get to see “Back to the future holey tires” again. Let’s have a Congressional Hearing to get updated on Man-made Global Warming AGW on March 6th. Should be nice – historical average temperature is 52 degrees. Whoops! An unusually chilly March 6, 2013 day and the snowstorm it spawned have shut down much of official Washington on Wednesday — including a hearing House Republicans had called to examine global warming. The average high temperature in Washington for March 6 is 52 degrees, with a record high of 81 degrees in 1961 and a record low of 10 degrees in 1888. Apparently there’s a lot of unpredictable “natural variability” in DC’s March weather! Just How Dull Does Obama Look Now? After months of scare tactics and demagoguery, Obama declared the Sequester would cause massive breakdowns in government services. He sent his emissaries to news shows and business and political meetings singing songs of disaster reminiscent of the Ten Plagues in the Old Testament. It’s clear that Obama and associates are dedicated to making the Sequester reductions as visible and painful as possible. That’s what any spoiled brat would do! There was a significant economic hit from last years tax and spend Bill. It was the increase in payroll taxes that has reduced private sector spending and activity. Why are we raising taxes on anyone in a down economy? The biggest impact of Sequester has been the financial markets positive view of the US finally doing something, albeit very limited, about our deficit spending and borrowing and our $16+ Trillion debt, which if not soon addressed, would surly lead to another credit rating downgrade. The stock markets positive view of the government starting to address our spending and borrowing has resulted in the DOW reaching an all-time high. Obama and the Senate Democrats have not had a budget for 4 years! This year’s budget was supposed to be published and passed months ago. It’s way past time for a budget that clearly shows spending reductions and the clear statement of spending priorities. We don’t need to shut-down the government over spending cuts – we simply just need to “cut spending”! Clint E: Life is hard; it’s even harder if you do dumb things. Roanoke Times, 3-4-203, Pg 4: Kerry: US to give $190 Million; says Egypt must resolve conflicts at home and abroad to get more aid. Kerry “Gives”? No, that’s not it! He’s not “giving” Teresa’s Catsup money away! This is US taxpayer money at a time when we’re $16 TRILLION in debt and borrowing $4 TRILLION each year just to pay our obnoxious bills. And also, No, that’s not the number! The number is $250 Million! That’s’ THREE TIMES the $85 Million Sequester that Obama and associates have declared will wreck the US Economy and cause massive disruptions. And this big US taxpayer give-away follows Obama’s gift of 20 F16s to his Egyptian Radical and Violent Muslim Brotherhoods. After these violent anti-American and anti-Semitic radicals were invited into the White House, we shouldn’t be surprised at this totally inappropriate malfeasance of US taxpayer money and totally misdirected US Middle-East political and military policies. Just more Obama Hope and Change! Massachusetts has enacted a law that gives transgender students unfettered access to whatever bathroom they choose to use any time they choose to use it. A student is “transgender” if they so state they are. Apparently there’s no SOLs or SAT tests that apply! Another major accomplishment by the Liberal-Progressive Movement! What a joy! Your daughter or granddaughter being forced by the State to accommodate this type of obscene and obnoxious intrusion into what most normal people consider to be a “private” place for private and personal needs. This forced access takes precedence over objections from any other student. It’s difficult to comprehend the thinking and values of those who propose these types of demands, no less those who convert them into state law. Based on the RT’s coverage of the transgender Hollins students, one might expect the Editorial Girls at the Roanoke Times to be elated with this big improvement in so called “Civil Rights”. However, it’s not clear they’re looking forward to “men” showing up in their bathrooms – but then again? Ever wonder, how are all these homosexual “choices” being made at such a young age? Reminds one of the story of a young boy who told his Mother he was gay and “coming out”. Mom’s response: What are you talking about? You’ve never been with a man! Trust me, it’s not that great! Roanoke Times, 3-3-2013, Pg Horiz-2: Editorial: Taxpayer-funded research belongs in the open. Obama (the oracle of open and transparent government) has directed that government funded research be made available to the public. And no better example of the abuse of government secrecy is the Man-made Global Warming AGW Alarmist malfeasance that has consumed hundreds of Billions of taxpayer money trying in vain to validate this bogus hypothesis. In the process, these misguided Alarmists have convinced policy makers to spend additional Trillions of taxpayer dollars in misguided and misdirected energy projects and priorities that will adversely impact our economic and energy systems indefinitely. Here in Virginia the poster-boys of refusing to make public the AGW taxpayer funded activities at UVA are Michael Mann and the UVA Executives who continue to use additional taxpayer money to fight FOI’s requiring public disclosure of documents. It’s way past time for Gore, Mann, The Alarmist Community and the Liberal Media to publish and explain the following graphic that simply shows “The Hockey Stick Graphic” and the current Jan 2013 NASA global temperature graphic from both ground stations and satellites. This composite demonstrates the totally discredited basis for Gore’s book and video and the Pied Piper parade that followed from it. Roanoke Times, 3-2-2013, Pg 3: Study: Fallout minimal from nuclear plant. The exposure risks to both first-responders and nearby residents are minimal and within normal life-choice parameters. No one is dying from radiation induced cancer. No one is getting any sick days off. Without a doubt this was one of the most colossal and obscene media and US government exaggerated disasters in history. Twenty-four hour, seven day a week for weeks; gross and unwarranted exaggerated fear mongering on all major media about the nuclear risk and damage. It is unconscionable for our government and media to carry out a hysterical program of mis-and-disinformation that caused such pain, panic and misdirected efforts. This fits right into the fear-mongering the US government has used relative to the home-radon hysteria and imposed regulations and major costs that home-owners have been harassed with. Clearly if one were to focus on radiation related health issues we would demand open and transparent government data, studies and outcomes of the radiation from the 500 nuclear air-bursts from 1944 through 1965. For example, these studies even involved secret analysis of deceased children’s teeth without parental knowledge or permission and the secret dumping of milk at farms and milk producers across eastern United States. Preventing the building of and operation of nuclear power plants. Mission Accomplished! Is that a good thing? Was it worth it? Roanoke Times, 3-2-2013, Pg 4: Protester's gather to keep piece of Berlin Wall Intact. This article totally omits the meaning and context and history of this gross edifice! I arrived as a young soldier in Germany in 1961, just before the Berlin wall was built. I spent 1961 through 1964 in Germany in nuclear-weapons missile artillery units deployed to help blunt the East-Blocks 60,000 tanks and 2 Million-man army assembled in what was then East-Germany. I joined thousands of other soldiers at the Fliegerhorst Kaserne near Hanau to participate in functions for President Kennedy’s significant visit to Berlin. I would hope that the German Government secures and maintains significant portions of the Berlin Wall for perpetuity so that future generations may reflect on the barbaric and dangerous actions of communism and The Soviet enslavement of 50 million East-Europeans for 50 years.